Loreto is the largest yet least populated department in Peru. It is covered by dense vegetation and by primary and secondary jungle with low hills and slightly rolling landscape, crisscrossed by the many rivers of the Amazon River basin, which is born at the confluence of the Marañon and Ucayali Rivers. Iquitos, the capital of Loreto, is the main port city on the Amazon River and the largest city in the Peruvian jungle. Different indigenous people groups like the Cocama, Huitoto, and Bora first inhabited the area. Then came the Jesuit missionaries who founded the city. At the end of the nineteenth century was when Iquitos experienced its greatest economic glory due to the rubber industry. The economic bonanza meant the construction of luxurious buildings like the art nouveau Palace Hotel and the Iron House, designed by the famous French architect Gustave Eiffel. In contrast to these buildings, you find the homes in the Belen neighborhood that are constructed on top of rafts and pylons to protect them from the flooding of the river. One of the best attractions in Loreto is navigating on the rivers and lakes and enjoying the beautiful beaches. The Pacaya-Samiria National Reserve (2,080,000 hectares), the largest reserve in Peru, is located 115 miles from the city and is home to numerous plant and animal species, many of them in danger of extinction like the charapa river turtle, the giant river otter, the black caiman, and the river dolphin. 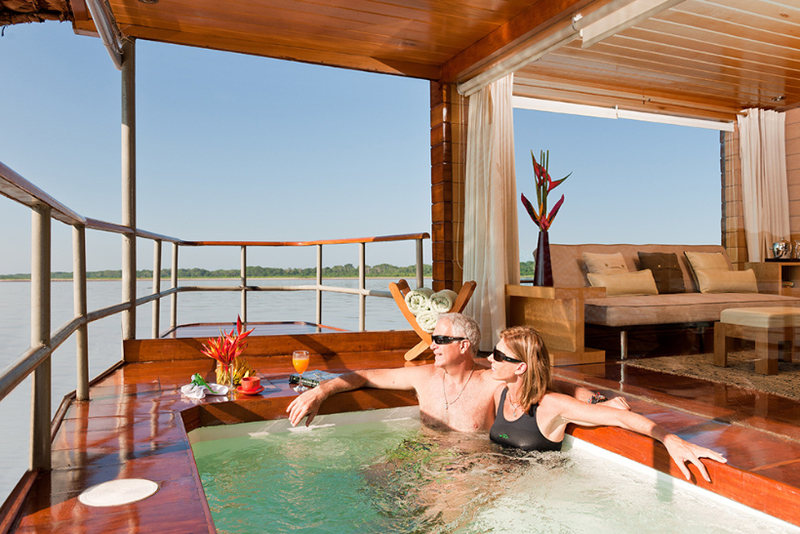 Delfin I is the smallest cruise ship sailing on the Amazon River. It allows you to discover the rich fauna and flora of the Pacaya Samiria National Reserve, the largest protected reserve in Peru which covers 5 hectares of floodplain forest. 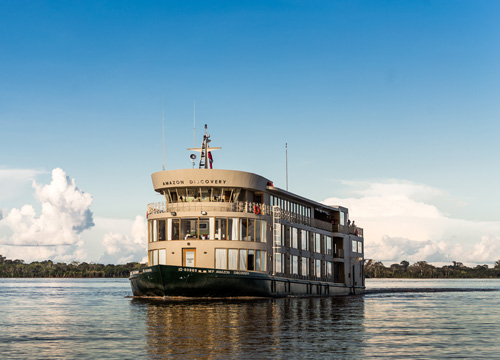 This cruise reveals the magic of the Amazon. Every morning when you wake up, you see new landscapes and authentic villages full of life. In the evening, you will enjoy the magnificent sunsets over the observation deck of the boat. 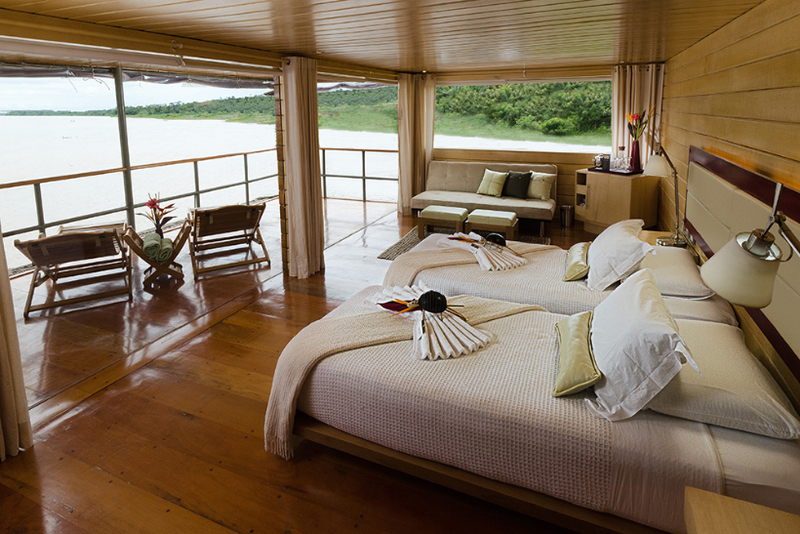 The boat counts 4 spacious air-conditioned suites with private terraces, two Master Suite with hot tub. 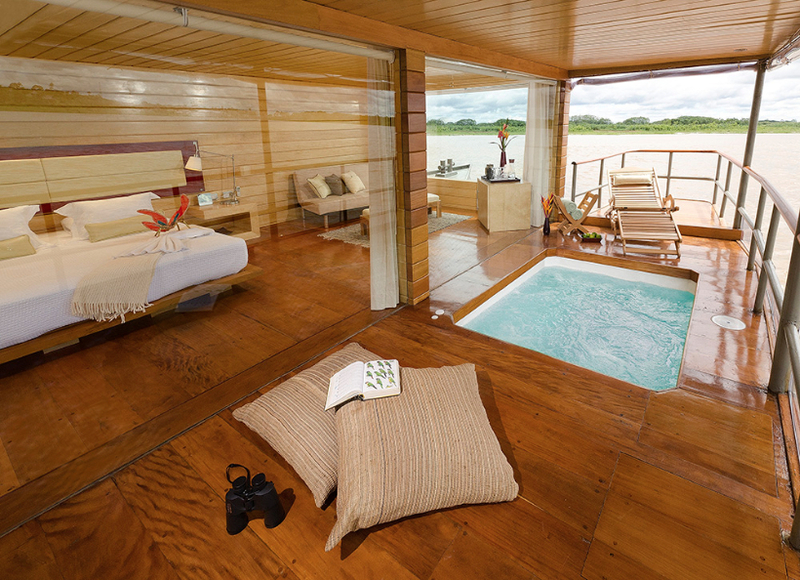 It offers a unique experience in the Amazon with optimal comfort conditions. The menu of the restaurant exalt your palate thanks to culinary delights carefully prepared reflecting the exotic nature and years of cultural mixing that have shaped Peruvian cuisine. Everything is served with the best South American wines.